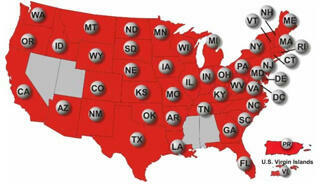 U.S. map showing states with Powerball. Someone who bought a Mega Millions ticket in New Hampshire came closer than most to winning the $1 billion prize. They matched five of the six numbers in Friday's drawing with a ticket now worth $1 million. A federal judge has turned down a request by the U.S. Department of Justice to dismiss a lawsuit brought the New Hampshire Lottery Commission. Thursday’s ruling comes in a case that centers on a surprise opinion released by the DOJ in November 2018 that could have broad implications for all lottery games. The state Attorney General’s office says disclosing the name of lottery winners in New Hampshire “is not something done for the sake of curiosity or sales promotion,” but instead is a crucial step to ensure the Lottery Commission operates with integrity and accountability. Jane Doe will remain Jane Doe.